Ready for a multi-sensory dining experience? Your tastebuds and senses are in for an intense treat at Nox. Picture yourself sitting in absolute darkness while a visually-impaired waiter serves and guides you through your three-course prix fixe dinner. It’s hard to imagine how you might actually navigate your cutlery in pitch darkness, or figure out what you’re putting into your mouth but all that adds to the mysterious allure of Nox, doesn’t it? As many can attest, this is one place you definitely have to experience at least once in your life. It comes by no flashy name nor signboard, but discerning folk from all corners of Singapore have made at least made one attempt at finding this elusive watering hole. Subdued and secretive, this hard-to-identify bar (unless you’ve done prior research) is known to deliver a superb cocktail experience. Their menu consists a line of spirits and American-style cocktails by Callahan and his team. It also serves a limited range of interesting craft beers and wines from the US. You can trust 28HKS to keep you ‘well watered’ with their on point mixes and award-winning experience. How does belting your favourite tune in private while enjoying a fancy meal sound to you? Though listed as a unique dining experience on this list, it’s really not about the food as much as the karaoke (singing of songs to music accompaniment as lyrics are displayed on-screen) experience with K Suites. Think VIP rooms equipped with good sound systems, comfy sofas or beds, a decent menu that includes wine, a wide selection of songs and great company (your friends). K Suites makes for an interesting place to unwind after a long day or for hosting cosy events. In addition to eating and singing till your heart’s content, special effects such as an audience’ applause and auto-tuning brings ‘dine-tertainment’ to a new level. Arteastiq is a dining concept that combines the best of food, tea and art against the backdrop of romantic high society. It features a menu with specially designed main courses: lighter offerings for the ladies, and heartier dishes for the men, not forgetting, artisans teas. You can expect to dine in the tasteful comfort of a regal interior complete with exquisite chandeliers and french jazz. What really sets Arteastiq apart from others however, is its integration of a social painting aspect. Not only can you enjoy good food, you can get in touch with your creative side through painting in their cosy studio. 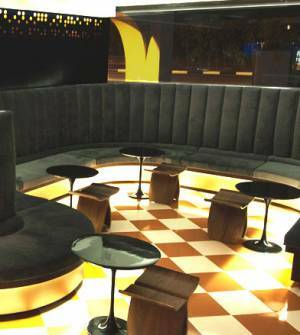 If you’re looking for a good place to relax alone or with friends, you should definitely give Arteastiq a go. ANDSOFORTH is a pop-up dining concept that thrives on creativity. On top of theatrical feasts, picnic gatherings and merrymaking, it is how they maintain a shroud of secrecy even while connecting with people that makes it so interesting. To have a taste of this elusive feast, you have to first make an online booking in advance, and will only be notified of the meeting location on the day of the feast. You’ll then be given clues on site, which will guide you to the actual dining venue. Diners are made to keep their lips sealed regarding the location of the ‘hideout’ so that no one is denied the opportunity to enjoy a full ANDSOFORTH dining experience. Cat lovers, this one’s for you. Think cosy cafe with premium coffees, artisanal desserts, books and of course, the best part – adorable cats. At Neko No Niwa, you’ll find yourself surrounded by well-groomed furkids who are free to roam in an interactive space. Charged by the hour, you can simply stay for a cuppa while soaking up the ‘catmosphere' or play with the them for as long as you like. A good place to unwind, destress or even work remotely as wifi and power plugs are readily available.